Former U.S. Vice President Al Gore and the U.N. climate panel won the 2007 Nobel Peace Prize for raising awareness of the risks of climate change. Gore Wins the Nobel. But Will He Run? Climate scientists are obsessed with finding tipping points, the levels at which the momentum for change becomes unstoppable. For environmentalists, 2007 is likely to be remembered as the tipping point when public understanding of the existential threat of climate change reached critical mass. If that's true, no one will deserve more credit than Al Gore, who was awarded the 2007 Nobel Peace Prize today along with the U.N.'s Intergovernmental Panel on Climate Change (IPCC). 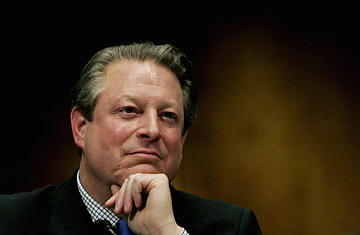 Gore spoke about the threat of the greenhouse effect as a Senator in the 1980s, when it was just emerging from the thicket of scientific literature, and after losing the presidency in 2000 he crisscrossed the globe, laptop in hand, to bring a warning to tycoons, politicians and ordinary citizens alike. The Nobel citation from the Norwegian committee says it all: "He is probably the single individual who has done most to create greater worldwide understanding of the measures that need to be adopted." Gore's win was widely expected, but there may still be those who wonder how an environmentalist could be, as the Peace Prize's description goes, the person who has "done the most or the best work for fraternity between nations." They shouldn't. Climate change is already a key instigator of conflict in areas like Darfur, where drought likely worsened by global warming helped trigger a civil war that has claimed over 200,000 lives. (Nor are Gore and the IPCC the first greens to win the Peace Prize; that would be the Kenyan Wangari Maathai, a conservationist and political activist who won in 2004.) As the IPCC's own reports this year show, unabated global warming will likely lead to competition for increasingly scarce resources and create waves of climate refugees in the hottest and poorest nations. A warmer world will almost certainly be a more violent one, so it's fitting that those who've done the most on climate change should be celebrated as warriors for peace. That the IPCC was named along with Gore came as more of a surprise, but it's an elegant inclusion. If Gore has been the lead singer on climate change for years now, the IPCC  a loose network of more than 2,000 scientists from around the world  has been his chorus. Established by the U.N. in 1988 as the final scientific authority on global warming, the IPCC has issued four assessments  the most recent this year  taking the current temperature of climate change. Reading the successive reports, which grow more and more confident about the reality and the danger of climate change, is like seeing an image fall into focus. Drawing on the work of so many scientists, which must then be approved by national representatives, the IPCC tends to the conservative  so its dire conclusions are all the more authoritative and chilling. But global warming is global, and the very existence of an impartial IPCC, in the face of competing national agendas, should give us hope that we can tackle climate change with the same spirit of international objectivity. And that's the point. Gore and the IPCC have been prophets of doom, laying out the threat of climate change for any who would listen. We cannot claim that we were never warned, and the message has sunk in for even the most recalcitrant listeners  witness President George W. Bush's White House summit on climate change last month. That success is a triumph for the rational scientific thinking that motivates both Gore and the IPCC. It's the idea that if we simply marshal enough facts, enough data, enough PowerPoint slides, and present them to the world, the will to solve the problem will follow as simple as 2+2=4. That spirit was sufficient to diagnose climate change, but it won't be enough to solve it  and here's where Gore has fallen short in the past. The Jeremiah of global warming proved strangely restrained on the issue during the eight years he spent as Vice President of the U.S.  eight critical years when the groundwork for preventing climate change could have been laid. He still talked about the environment, but what matters is that he spent little in the way of political capital to actually do anything about it. During the 2000 election he even ran away from his environmental reputation  "Ozone Man," the first President Bush liked to call him. It was a moment for political leadership, and Gore did not provide it. Now he may have a second chance. The big question for greens today is: Will Al run? No one knows for sure, but the signs aren't good. One clue might be found in the statement he issued after winning the Nobel. "We face a true planetary emergency," he said. "The climate crisis is not a political issue, it is a more and spiritual challenge to all of humanity." But Gore is wrong. Climate change absolutely is a political issue, the greatest political issue of our time, and it will only be solved in the political arena, with all the mess and compromise that entails. Environmentalists hate to hear this; they think that global warming is so important it should transcend politics, as the IPCC does, and as Gore himself has in many ways these past seven years. But the final war on global warming will be fought not with PowerPoint but with politics, and it will be fought in the halls of power around the world. The scientists represented by the IPCC have spoken  what we need now are passionate, even partisan political soldiers to lead the way and push the final tipping point from awareness to action. I can think of a pretty good general.